Rust. We hate it, and it is one of those unsightly things to see. Mr. Kustom of Chicago has an end to that with our Auto Rustproofing Protection and Undercoating packages. Keep rust from starting; and address it once it has started. With our Car or Truck Rustproofing Protection and Undercoating packages, your vehicle will last longer, delaying the need to buy a new one. Also the resale value increases. Rust is an electrochemical reaction which occurs when water contacts bare steel. Creases or depressions in the metal can trap moisture, increasing contact time which causes more rusting to occur. The rate of rusting increases with temperature. Unlike such places as Arizona and the far west where salt is never or seldom used and the dry air or extreme temperature naturally inhibits corrosion, Chicago’s moderate climate puts it in what is often called the Rust Belt. The image to the right shows what happens when your vehicle is not protected with our rustproofing & undercoating protection. Mr. Kustom Auto Rustproofing Protection and Undercoating packages protect your vehicle from the deterioration caused from snow, road salt, and cold weather. 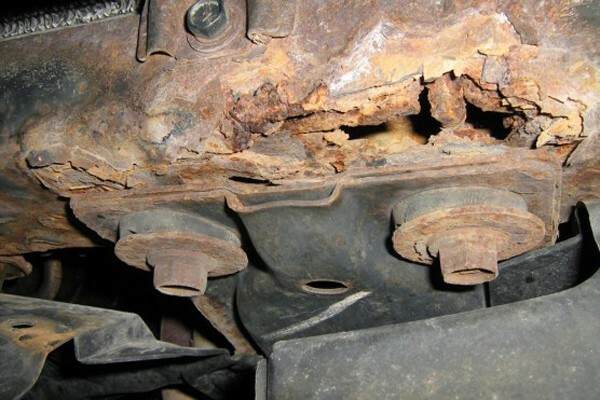 Auto Rustproofing Protection and Undercoating is a process of spraying a rust-inhibiting chemical to the underside of your vehicle’s body, along with other rust prone areas. Our thick rustproofing seals out all the elements that cause rust. With some of Mr. Kustom Auto Rustproofing Protection and Undercoating packages, we treat the fenders, rocker panels, under carriage, and all other areas prone to rust. IF YOU WOULD LIKE MORE INFORMATION ABOUT OUR AUTO RUSTPROOFING PROTECTION AND UNDERCOATING, PLEASE CALL 773-583-3770 AND SPEAK TO ONE OF OUR AUTO RUSTPROOFING SPECIALIST.